•Customize aspects of your ships like cannons, anchors, sails and much more! The skyways of the Spiral are full o' dangers, from rabid Skyfish or Buffaloons to the dreaded Storm Sharks and Battacuda. But the most dangerous enemies a Pirate's like to meet are other ships - the navies o' Monquista and Marleybone have standing bounties for pirates, the Armada hunts us tirelessly, and we Pirates have even been known to war with our own kind - Bilge Rats and Cutthroats always shoot first. 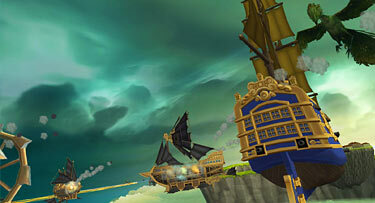 To make it as a Pirate, ye’ll need to master Broadside Combat, the fine art o’ ship to ship fightin’. Whenever enemy ships get too close, cannon fire starts and Broadside Combat begins - it keeps goin', too, with timed volleys battering each side. 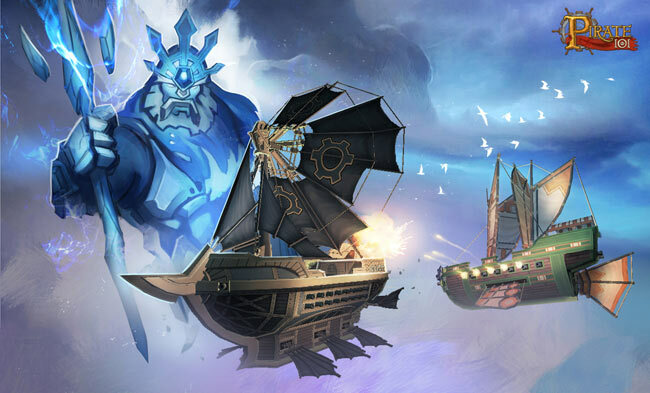 In addition to her guns, every Ship also has Powers to use in battle: special tricks like Chain Shot, a volley o' Flamin' Arrows, or a magic Summons that can call up a Kraken or a Storm Lord to take a swipe at yer foe! 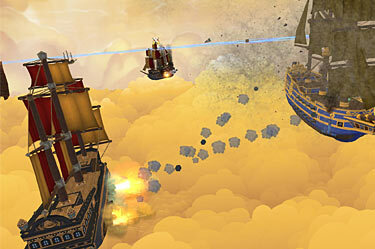 In Broadside Combat, the fighting ships circle each other, hammerin' away with Cannon volleys and Powers. When a Ship's Health turns yellow, she's Crippled; ye can race up an' Board her to finish the fight face to face and eye to eye. Or, if ye like, keep yer distance an' let yer Powers and Cannons blast the enemy Ship to smithereens. As yer ship takes damage, Damage Tokens appear on deck - if ye have a friend or two aboard, they can run about an' remove the Tokens, ensurin' yer deck's in ship shape if a Boarding action starts. If these Tokens are left alone, they'll turn into deck fires that'll burn anyone who comes too close. Beware! Don't Forget Your Ship Armor! So, how's a Pirate get an edge in Broadside Combat? 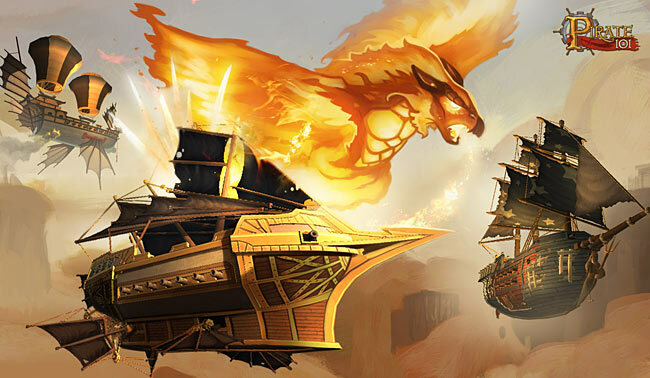 Well, Ships have equipment, just like their captains - upgrade yer Cannons to do more damage, look for new Wheels, Horns, or Figureheads to get better powers, or plate yer Ship in Armor! Light Armor fortifies yer ship and makes yer attacks more accurate, while Heavy Armor trades speed and volley time fer strong protection and extra Health. 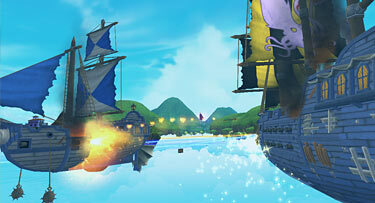 As ye fight more battles, ye'll gain Nautical levels, and unlock better Ship equipment. Look sharp, and stand by to repel boarders!